Worthing chairman Pete Stone wants to see average attendances of more than 1,000 at Woodside Road within two years. The club have ambitions to reach National South and Stone, who took over as chairman three weeks ago, wants both the club’s men’s and ladies’ teams to progress on and off the pitch. When owner George Dowell took control of Worthing three years ago, he set a five-year plan to be in National South. 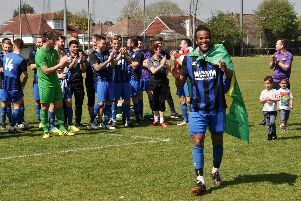 The club won promotion from the South Division of the Bostik League in his first season but pitch problems – and playing five home games at Bognor this season – looked to have put the plan back a year. However, Adam Hinshelwood has turned things around after returning as the club’s manager in October. After picking up just three points from their opening 15 matches, Worthing now sit 16th in the Bostik League Premier Division. Stone hopes to see the club rise into National South within two years and also wants to get more people through the gate at Woodside Road – for both the men’s and ladies’ side. Worthing’s average attendance has climbed from 250 to more than 660 in the past three years and over 1,100 watched the win over title favourites Billericay earlier this month. Stone said: “Within two years, I’d like to see an average home crowd greater than 1,000 for the first team. That will be a key indicator for me of how successful we are. But also we’ve got the ladies’ team and I’d like them to have an average attendance of more than 200 if we can get them to a higher level. “Curtis Foster now runs the ladies’ team, who are very ambitious and aspirational. And it opens up opportunities for girls in the community. “It’s also going back to the DNA of the club which is bringing through and using the very best talent in this whole region. When you come to watch a game at Worthing, you’re seeing people you grew up with or know very well. You then get that attachment to the players and an attachment to the club. “There’s a load of football supporters in this area and we want to tap into that. “There are ten areas smaller than Worthing that are sustaining Football League clubs. Burnley are in the Premier League, Wigan have played in the Premier League and the list goes on. Stone, a management consultant in the world of investment banking, played for Leeds City Boys Youth –Leeds United’s Academy – as a youngster then played and managed London Edinburgh Insurance in the West Sussex League after moving to Worthing in 1989. He has previously spoken about the club’s three-part vision, which is to be a club the community of Worthing can be proud of, to be as professional off the pitch as they are on it and to be regarded as a National League club. Stone feels the set-up of the men’s and ladies’ teams on the pitch is fantastic but admits there is work to be done off the pitch. He said: “We’ve got to bring some financial stability to the club. We’re not in a desperate situation like many other clubs but we need to be a little bit more controlled with our finances, we need to be a little bit more stable, we need to be self sufficient. “If you put it into context, we need about £200,000 a year just to make a tiny surplus which gives us a little bit of a buffer. Stone will hold the first board meeting since becoming chairman tomorrow and admits the club will start to be run like a small company, with volunteers having clear roles. He said: “Football is big now. We’ve got the first team, the ladies, the 18s, the academy, the scouting, the player liason, the contracts, some of those are roles in their own right. “You look at the operational side, keeping everything going from day to day, week to week, month to month. Everything from pitch maintenance through to ground maintenance through to matchday and also administration. One of Stone’s main ambitions at Worthing is to create memories which people will remember forever. He feels promotion into National South will do that and said: “That would be astonishing. Some boys dream of a Ferrari, some boys dream of playing for Leeds United and some boys dream of being responsible for a club. “It’s what it would mean for younger kids, older people, the women, the men, the boys, the Away Boys, the Suppporters Association, George, the players. “I’ve said it to a lot of folks internally that where I get a huge kick is seeing the reaction when Worthing score and at the final whistle when Worthing win. The club’s pitch issues are still on-going and Worthing have a FIFA quality certification test booked after the final home game of the season. Worthing played their first five home matches of the campaign away after the pitch failed three tests and Stone said: “I am restricted in what I can say but we are in a formal process at the moment to try to recover some of the lost money we incurred at the start of the season. “The pitch is still a concern for the long term. We have got the test booked in straight after our last game of the season. “We are working through what scenarios could play out and how we’ll deal with those.